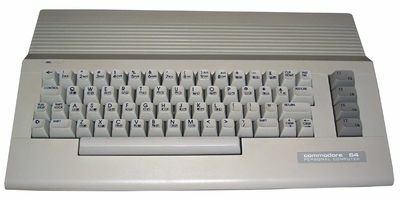 The C64C is a redesign of the successful Commodore 64. Due to the light color and the slim cabinet it can be easily distinguished from the original C64 ("Breadbox"). The official name was C64C, although in Germany the magazine 64'er introduced the name C64 II. According to the technical specifications there were no differences between the C64C and the original C64. The units are very similar in terms of graphics, sound, processor speed, interfaces and RAM size. The C64C (aka C64-II) was the first C64 which didn't have a breadbox cabinet. The (almost) white color complied with the color of the C128(D) and also the cabinet was similar to the C128 (apart from the missing numeric pad). In the year 1986 the C64B and C64B3 boards were assembled to the C64C (C64-II). The graphic symbols of the keyboard are printed on the front of the keys. From 1987 on only the smaller C64E board was assembled. The graphic symbols are printed on the top of the keys. So it was possible to identify which board was assembled without the need to open the cabinet. The sound chip (SID) now had the naming MOS 8580. A sound difference between the 6581 and the 8580 is audible. The C64E board was significantly higher integrated. The RAM memory now resides in 2 instead of 8 RAM chips. The two 8k byte sized ROM chips for BASIC and kernal have been joined on one 16k byte sized ROM chip (251913-01). The PLA chip and some TTL chips have been integrated into a 64 pin chip (251715-01 or 252535-01). The "252535-01" contains the color RAM as well. Through this the production costs could be reduced and so the C64C could be offered for a lower price than the original C64 "Breadbox". The C64C was 100% software compatible. Due to the slim cabinet some internal expansions (e.g. floppy-speeder) couldn't be built in any more. Since the 8580 soundchip (SID) uses different filter units, mainly "samples" are almost not audible any more or at least have a very low volume. With the C64C an early version of the new graphical operating system GEOS (Version 1.2 or 1.3) was delivered. Also there with the disk drive 1541C there was a disk station which had the same colour than the the C64C. Also the 1541-II which appeared little later and had a separate power supply, had the same matching color, which was already used for the C128(D). This page was last modified on 6 September 2018, at 16:02.